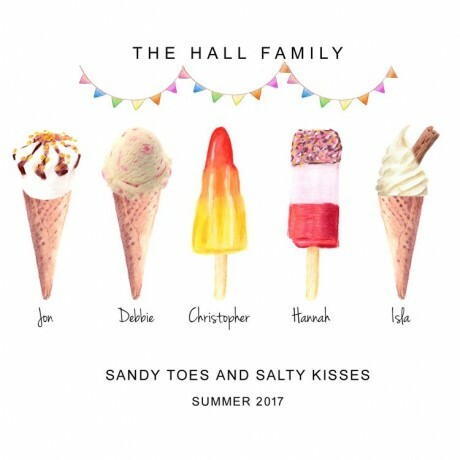 A truly personalised illustration print of your family's (or friends') favourite ice creams, created especially for you - a perfect gift or keepsake! 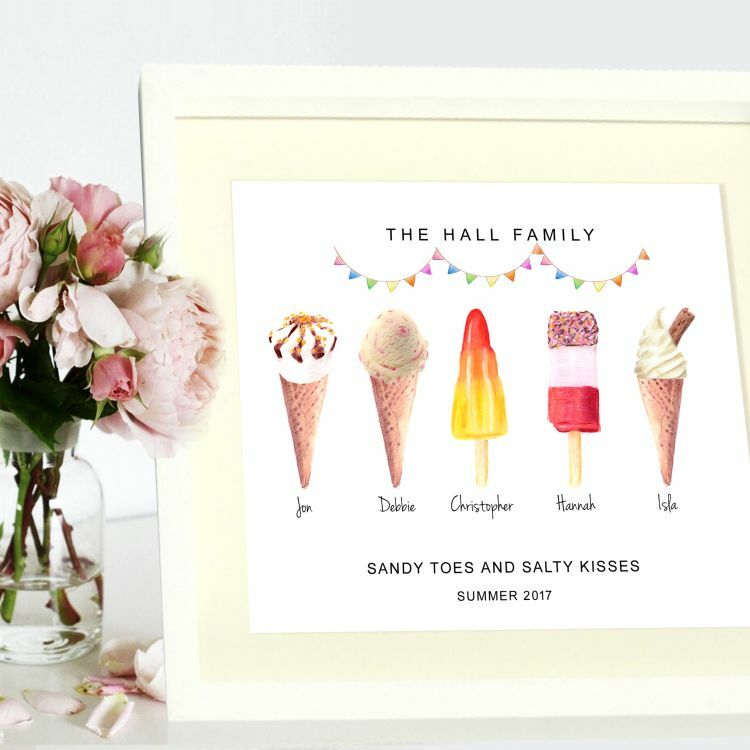 A fully bespoke service to illustrate your chosen ice-creams, making a fun and very unique print which would make a lovely family keepsake to remember memories of this year's summer holidays. Using professional grade colouring pencils and paper, Wide Mouth Smiles illustrate your items on a large scale so that all the fine details can be captured, resulting in a very detailed and unique style. The individual elements are then scanned in and digitally brought together, along with your chosen text. Your illustration is printed onto 280g professional grade microporous satin pearl paper, with a mix of dye and pigment inks for long lasting results (300 years in a photo album) resulting in a stunning finish. 1. Select the finishing options you require and fill out the information needed to create your unique print (the title of the print, what ice creams you would like, what name is associated with each ice cream). Please Note: The order of names/items given will be the order illustrated. 2. Wide Mouth Smiles will send you a proof to check you are happy, and once you have confirmed you love it, they will proceed with printing and confirm a shipping date. Please note: it is your responsibility to check the details of the proof and sign off prior to printing. As this is a bespoke service that is illustrated just for you please allow around 5 working days from order to the first proof, then 3 working days after your authorisation to proceed to print/handfinishing/framing, after which it will be dispatched. However, please let them know if you need your print by a specific date and they will do their best! 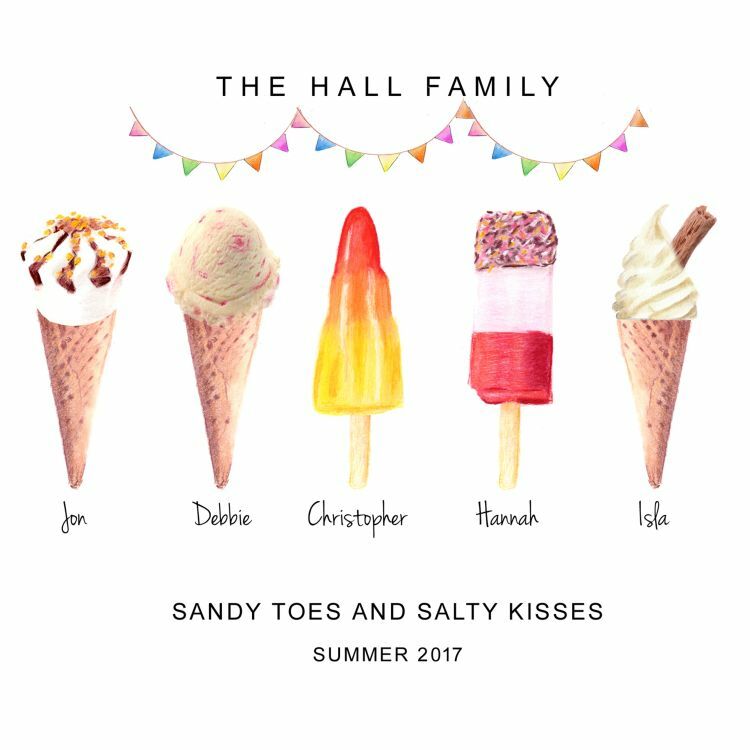 Please note that each illustration is an artist’s impression and not an exact replica of the ice cream. DUE TO THE CUSTOMISED NATURE OF THIS ITEM, WIDE MOUTH SMILES ARE UNABLE TO MAKE REFUNDS but will do their best to make sure you are happy with your purchase. I ordered the personalised drinks illustration for Father’s Day. The gift arrived in beautiful packaging and looked absolutely stunning. I ordered with the frame as well and it was a Next frame so definitely worth every penny.The communication from start to finish with the sellers was brilliant. I would definitely recommend as the attention to detail was spot on. This product is dispatched by Wide Mouth Smiles. This item has a shipping weight of between 200g and 1,000g depending on the options selected.